Take control of your health today with effective prostate support that works. For over two decades, Super Beta Prostate has been the top brand in America to help support prostate health. Made with naturally sourced ingredients, it may help reduce urinary urges, improve bladder emptying and decrease nighttime bathroom trips! Ignoring your prostate won't help, but Super Beta Prostate can!The Super Beta Prostate formula contains 10 powerful ingredients including a scientific breakthrough called Beta-Sitosterol. Beta-Sitosterol is a natural substance found in nearly every plant including saw palmetto berries. It has been studied for its several health benefits including improvements of urinary tract functioning and supporting normal prostate health. 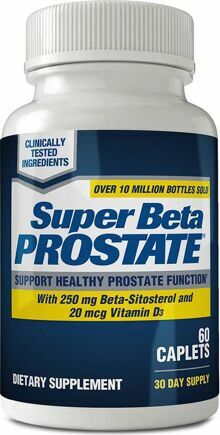 Super Beta Prostate's exclusive formula combines Beta-Sitosterol with other essential minerals including 100% of your daily value of vitamin D along with zinc, calcium and selenium to promote optimum health for men over 40. Each highly concentrated serving contains 250mg of Beta-Sitosterol and 600mg of mixed plant sterols. By comparison, you might have to take up to 100 same-size saw palmetto capsules to get the same amount of plant sterols in just 1 Super Beta Prostate! -Promote healthy prostate Function-Reduce frequent urinary urges-Improve bladder emptying-Stronger urine flow-Fewer bathroom trips - day and night!